Results: have you ever had a smartphone damaged by water? Nowadays, water-resistance or at least some type of splash-resistance seem to be a must on flagship (and midrange) smartphones. It used to be a rare commodity and mostly featured on rugged phones like the Galaxy Active series or any one of those tanky CAT handsets. Now, you can usually breathe calmly when your phone is near the kitchen sink or next to a spilled drink. 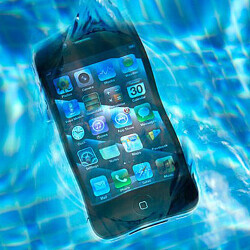 Have you ever had a smartphone damaged by water? Sad to say - more than once. But less than 10 times, I promise! Yes, it happened that one time. Rice in a bag did not help. Had a scare once, but managed to dry it off and rescue it. Nope, never. Sad to say - more than once. But less than 10 times, I promise! Yes, it happened that one time. Rice in a bag did not help. Had a scare once, but managed to dry it off and rescue it. Had someone at my Fourth of July party drop their Galaxy in the hot tub last night It survived! 4th of july on the 3rd? Does drinking/partying until the sun comes up make sense when you have work the next day? :p We all had off on Tuesday so a Monday night party worked best. Quite common around the states. Just once. I dropped my LG G2 in the tub whilst giving my infant a bath. Take mine swimming often. Did it with s5, s7 and s8. No issues at all yet. Never salt water though. I know it will be fine at the time but erodes the resistance over time. I was an expert in giving my Lumia 920 a wash once a month with hand soap without filling any of the ports with water. But one day, it was a different day. Maybe the law of averages caught up with me and my phone. Send it for repairs, but hands free option during calls will not work.